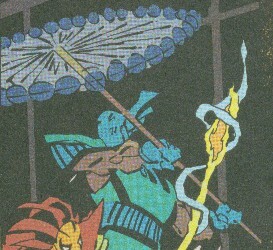 POWERS/ABILITIES: Each of the Snakeroot were ninjas and master warriors, with Tegaki being the deadliest warrior. They each used various ninja weapons, such as swords, shuriken (throwing stars), bos (staffs), etc. The power of the sword Sakki allowed them to be resurrected, but each time they were revived, the lost a little bit of their life, leaving their flesh in a decaying form. (Elektra: Root of Evil#1 (fb) - BTS/ #2(fb)) <934 AD> - A monk named Tomonori, legendary for his compassion and his skills with fire and steel, found a way to entrap man's brutal nature, and he folded it into the great sword he was forging. Tomonori thought to keep the fury locked away forever, but it growled and shrieked from within the blade. The blood and life force of the innocents were the desires of the sword, Sakki. Sakki's hunger tore at the metal, rotting it through...until the Snakeroot clan found a way to feed it. Tempering Sakki in innocent blood, they made it like new once more. They made Sakki into their fearsome icon. 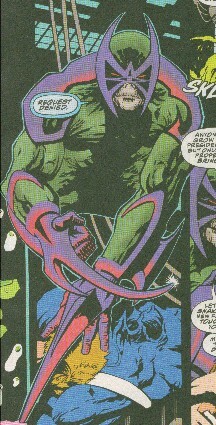 (Daredevil I#319 (fb) - BTS) - The Snakeroot are the darkest masters of ninjutsu, allegedly serving as the progenitors and/or Inner Circle of the Hand (see comments). Regardless, they serve the same Beast as does the Hand. (Daredevil I#323 (fb)) - Harry "TNT" Kenkoy traveled to the Snakeroot's stronghold, proposing an alliance to obtain the About Face virus. Daito sent one of the Snakeroot to attack him, and when Kenkoy proved himself by slaying that agent, Daito inducted him into the Snakeroot as Budo. (Daredevil I#319) - Lord Daito sent members of the Hand to assault the Pentagon, causing a distraction that allowed Osaku to more easily appropriate the file on the About Face virus. Upon Osaku's successful return, Daito sent her and Tekagi to retrieve John Garrett from his SHIELD holding chamber. (Daredevil I#320) - Tekagi and Osaku assaulted SHIELD substation 14 storage, slaughtering the security and abducting Garrett. (Daredevil I#321) - Kenkoy, plotting to betray the Snakeroot, lost contact with his agent Thomas Nyeung when he was killed by Venom, who sought the virus for his own purposes. 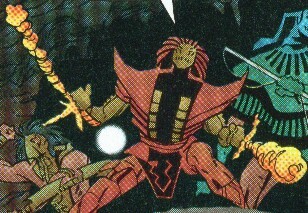 From their stronghold, the Snakeroot (Daito, Genkotsu, Tekagi, and the rest) and the Hand combined their energies, focused by Genkotsu, intending to draw forth the dark essence of Elektra from the mind of Garrett, intending to use it and the About Face virus to form an invincible shadow warrior under their control. (Daredevil I#322) - The Snakeroot (Budo, Daito, Genkotsu, and the rest) and Hand successfully transferred Elektra's dark personality into a corpse, reanimating it as Erynys, though they would need the virus to make the reanimation permanent. Tekagi, Enteki, and Budo later tracked down Eddie Passim, though they fell into an ambush by Siege, who had been sent to recover Garrett from the Snakeroot. 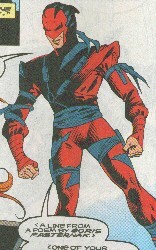 Daredevil joined the struggle to protect Passim, but Enteki sacrificed his life in battle against Daredevil, delaying him enough that Budo and Tekagi could escape with Passim. (Daredevil I#323) - Bisento led a pair of Hand agents to attack Siege and Daredevil for their previous actions against them. 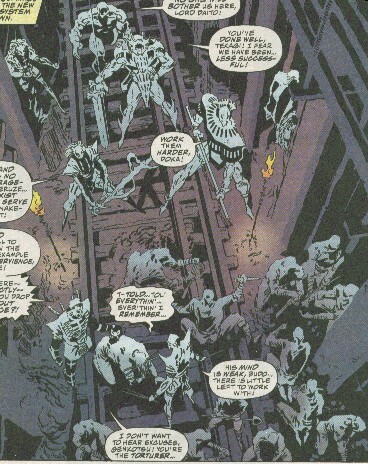 The heroes slew the Hand agents and captured Bisento, but then Venom arrived, seeking the About Face virus himself. 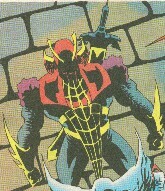 Siege and Daredevil saved Bisento, who came to regret his past activities and named the location of their Belvedere Castle base, as well as the creation of Erynys. However, before he could say any more, he was slain by a sai from Stone. At the same time, Budo and Genkotsu tortured Passim to learn the location of the About Face virus, while Erynys and Garrett presented themselves as complete and ready for action. (Daredevil I#324 (fb)) - Enteki's son was promoted to take his father's role as the new Enteki. (Daredevil I#324) - Enteki assaulted Daredevil, Stone, and Morbius (also seeking the About Face), but was driven off. Garrett and Erynys later confronted the same three heroes, but Erynys' incomplete nature and ties to Elektra forced to Erynys to flee when the true Elektra arrived. (Daredevil I#325) - The Snakeroot brought Passim into the New York subways, directing the Hand to dig into the floor of the railway, seeking the vial of virus Passim had hurled there years before. Genkotsu and Budo, under Daito's direction, continued to torture Passim to force out more specific information, but Passim's weakened mind appeared to be too fragile to give out that information under force. Ultimately, Doka determined that the section of track that contained the vial had been moved elsewhere. Knowing this same information, Daredevil and Elektra managed to track down the vial, but the Snakeroot followed them to the same site, while the demonic Hellspawn followed them as well. As Elektra and Daredevil opposed the Snakeroot, Passim sacrificed himself to slay Budo with his remaining psychic power. 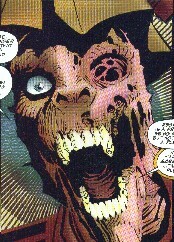 Daredevil smashed the vial into the mouth of Hellspawn, effectively ending the race for the virus by destroying it. As Siege arrived and helped drive off the Snakeroot, Erynys was slain by a sai hurled by Daredevil, in the process returning Elektra's dark essence to its original source. With both aspects of their goals destroyed, Daito ordered the Snakeroot to withdraw, so that they might wait and strike from the shadows in the future. (Daredevil Annual#10) - Daito led the Snakeroot to resurrect Ghost-Maker to slay Daredevil and Elektra; he was slain by Elektra, fighting alongside Daredevil and Ghost-Maker's old enemy, Shangh-Chi. The Snakeroot again resurrected him, but decided he wasn't yet ready to serve them; Ghost-Maker plotted betrayal of the Snakeroot. (Daredevil Annual#10/2) - Osaku, an old enemy of the Black Widow, attempted to kill her, but was defeated instead; however, she managed to break free from the Widow and escape when the police arrived. (Elektra: Root of Evil#1) - Lord Daito committed seppuku, ritual disembowelment via Sakki, the sword that was the power behind the Snakeroot, effectively corrupting and weakening both it and then. Tekagi assumed the role of new leader, decried Daito, and revealed the need to perform the ritual of purifying Sakki via innocent blood. (Elektra: Root of Evil#2) - The Snakeroot outlined their three targets: Father Peter Nova, a priest working the inner city; Navajo activist, Singer Tsilkali; and Nobel Peace Prize Winner, Dr. Aaron Sokoto of Aradenni. Tekagi met with a youth, Max, and led the Snakeroot to slay Max's antagonist as they prepared to take down Father Nova. Elektra organized her own Ryo, or Order--Impact, Lynch, Masquerade, Niko, Salvo, and Target, to defend their targets. However, the Snakeroot's first assault took out two of her order, Niko and Target, and Elektra took Nova and fled. (Elektra: Root of Evil#3) - Elektra fought off and slew Doka, Feruze, and Genkotsu, while Tekagi slew Masquerade, Salvo, and Impact, and then slew Nova, as well. Tekagi then left Elektra behind to pursue his next target. Tekagi regrouped with his resurrected agents, assuring them that he had no loyalty to Elektra, and he slew an approaching tiger with his bare hands, offering it as a feast to his warriors. (Elektra: Root of Evil#4) - Doka, Enteki, and Feruze tracked Elektra to the Chaste Fortress, but fell into her traps and were all killed. Elektra next traveled to Arizona, where she slew Osaku, stopping her from capturing Singer Tsilkali. She then left a first aid kit with note by Tsilkali's side and drove Tsilkali's truck, duping Tegaki and Genkotsu into thinking she was Osaku long enough to smash into them. 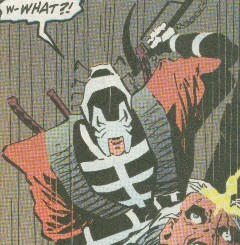 Genkotsu was paralyzed and the crash, while Elektra confronted Tegaki directly. There battle was even, but Elektra wore a suit of armor soaked in tree-frog venom. As they were wounded, each began to feel the effects of the poison. Prepared, Elektra took advantage of this, stabbed Tekagi repeatedly, and then skewered him with Sakki. This not only slew Tekagi, but also completed the corruption of Sakki, rendering it impotent, making resurrection no longer an option for the Snakeroot. Shortly thereafter, Singer Tsilkali revived, read the note, and drove to Elektra's side, applying the antidote to the poison. COMMENTS: Created by D. G. Chichester, Scott McDaniel, Collazo, and Candelario. This profile hard to follow? Sorry, so were the issues. I've resorted mostly to just listing the activities to try to cover them accurately, as motivations and goals were sometimes unclear. Anyway, if I missed any points or key information, let me know, and I'll add it to the profile and give you credit. Who knows what the Snakeroot's role is in the origin of the Hand, as fewer and fewer writers know and/or care about past continuity. The origins of the Hand as told in the current Elektra: The Hand series has nothing to do with any past origins of the Hand. Anyway, they appear to have either splintered from the Hand (or vice-versa), apparently controlling the Hand for an unknown time period. With their demise, the Hand apparently took back its own destiny. We'll see...then I guess we'll come in and try to clean up the mess in the Handbooks. I am uncertain whether the historical dates given for Passim, the About Face virus, or Kenkoy are, or need to be, topical. Passim and Kenkoy both might have had some exposure to the virus (or some other reason) and thus might age at a slightly slower than normal rate. If not topical, then the bulk of the virus was destroyed in June, 1963. If they are topical, then they would reference events approximately 30-31 years before the modern story. The story also discusses SHIELD being involved in the creation of About Face. They were named SHIELD at least once (DD322), and they did show a Helicarrier and Flying Car, as well as Nick Fury. However, SHIELD did not form until after the start of the modern era, with Tony Stark being involved with its creation AFTER he became Iron Man. However, since it wasn't repeatedly named as SHIELD and since Fury was active in the 1960s, I think the events could still stand, if detailed as some earlier espionage group or just a division of the Department of Defense. Alternatively, if it has to be SHIELD, then, yes, the dates are topical, AND the time scale is wrong, as it could not have been more than 10-14 years before the story in DD319-325. The first confrontation between Karla and the Black Widow was described as taking place in East Berlin, with the Widow escaping over the Berlin Wall, but that info is topical, as the Wall fell before the modern era of comics (or it will have soon), due to the sliding timescale. A former United States Marine Corps General, he was nicknamed TNT because he'd blow through anything between him and what he wanted. (Daredevil I#320 (fb)-323(fb)) - He somehow came to run the Department of Defense's About Face operation, in which they captured a number of ESPers, including Eddie Passim and Theresa Bellweather. Kenkoy slew Bellweather, harvesting some of her tissue and gene splicing it to the virus, making it subject to human thoughts. He intended to conduct a large scale test of About Face, using Passim as a telepathic trigger for the virus' mutagenic effects, but Passim and 23 others disposed of most of the virus, though one of the vials remained intact, lodged in the floor of the Manhattan subways rail system. Kenkoy had the other 23 agents slain to eliminate loose ends, but Passim escaped, hiding out amongst the New York homeless for many years. Kenkoy was eventually court-martialed for murder and conspiracy and became involved in drug-dealing. In recent years, he came upon the idea of retrieving the missing vial of About Face, intending to use it to create the perfect heroin user, every bit as addicted, but immune to the drug's lethal qualities. (Daredevil I#323 (fb) -BTS) - Kenkoy traveled to Hong Kong, appearing before the Snakeroot to request their assistance in regaining the About Face virus. They thought him weak and nearly slew him, but when he fought back and killed one of their agents, they accepted him into their ranks as Budo, or "military way." (Daredevil I#319, 320) - Posing as a cousin of Passim, Kenkoy hired Silver Sable to locate and retrieve him, but Daredevil convinced her to call off the search by revealing Kenkoy's motives and telling her that Passim had no relatives. (Daredevil I#321) - Kenkoy discussed his heroin plans with his agent, Tommy Nyeung, but Nyeung was slain by Venom, who sought About Face for his own purposes. (Daredevil I#322-325) - Budo joined the rest of the Snakeroot in creating Erynys, after which he assisted in the capture of Passim, and his subsequent torture in an effort to force him to reveal the location of the missing vial of About Face. 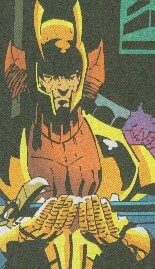 Upon locating the vial, Budo tried to kill Passim, but the telepath sacrificed his own life using the last of his power to shatter Budo's mind, killing him and finally gaining vengeance for Theresa Bellweather's death. Aka Lord Daito, the former leader of the Snakeroot, he directed the creation of Erynys, the efforts to obtain the About Face virus, and the resurrection of Ghost Maker. Upon his failure, he was tortured and humiliated by his master, the Beast, after which he committed ritual suicide with the Snakeroot's sword of power, Sakki, tainting it and diminishing the Snakeroot's power. Raised by an abusive family, he slew them in their sleep by setting fire to their villa. He was slain by Elektra in battle against her and her Ryu, but was resurrected and sent to ambush her in the Chaste's fortress, only to be slain yet again. He created and projected flames by uncertain means, possibly pyrokinesis. Like most of the Snakeroot, his flesh had begun to decay after repeated resurrections. Father to his successor, he accompanied Tekagi and Budo in the mission to capture Eddie Passim. 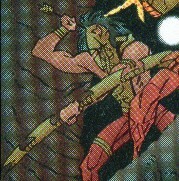 Opposed by Daredevil and Siege, Enteki tried to strangle Daredevil with his bowstring, but he was slain by a sai thrown by Stone. However, his sacrifice caused enough of a distraction that Tekagi and Budo were able to escape with Passim. Son of his predecessor, he was recruited into the Snakeroot at a young age. When Morbius, Stone, and Daredevil approached the Snakeroot's base below Belvedere Castle, he opposed them, though his arrows failed to penetrate Daredevil's new armored suit, and Daredevil also foiled his effort to slay Morbius. Tekagi praised his performance against the heroes, and he was given his father's mask and identity after he was slain by Stone. He accompanied Doka and Feruze to ambush Elektra at the Chaste's mountain stronghold, but he was slain by her instead. An African-American, he was rejected from fine schools due to his race race and background; he found the Snakeroot knew no such restrictions. He was slain by Elektra in battle against her and her Ryu, but was resurrected and sent to ambush her in the Chaste's fortress, only to be slain yet again. A former holy man, he somehow became the torturer for the Snakeroot, perhaps still finding peace in the careful application of pain. He led the actual creation of Erynys and the torture of Eddie Passim. He was slain by Elektra in battle against her and her Ryu, but was resurrected and accompanied Tekagi and Osaku in the effort to sacrifice Singer Tsilkali to Sakki. His back and/or legs were crushed when Elektra posed as Osaku to get him to lower his guard and then crashed a truck into him. He complained of not being able to feel his legs, and Tekagi told him to die there in the dirt. A Russian female, she was a descendent of the Russian Tsars. She volunteered for the duty of bringing the Black Widow (Natasha) to justice after she defected to America. After two years of pursuit, she caught up to the Widow in Berlin, shooting her in the shoulder, but the Widow managed to escape her, taunting her with how little respect she would gain if she actually were successful. Later, when she was told by her superiors that her mission was cancelled, she refused to accept that. Disaffiliating from her superiors, she eventually joined the Snakeroot as Osaku. She stole the About Face files from the Pentagon and assisted Tegaki in retrieving John Garrett from SHIELD. She again attempted to kill the Widow, but was defeated instead; however, she managed to break free from the Widow and escape when the police arrived. She was sent to capture Singer Tsilkali so they could sacrifice her to Sakki, but she was instead ambushed and slain by Elektra. In 934 AD a monk named Tomonori, legendary for his compassion and his skills with fire and steel, found a way to entrap man's brutal nature, and he folded it into the great sword he was forging. Tomonori thought to keep the fury locked away forever, but it growled and shrieked from within the blade. The blood and life force of the innocents were the desires of the sword, Sakki. Sakki's hunger tore at the metal, rotting it through...until the Snakeroot clan found a way to feed it. Tempering Sakki in innocent blood, they made it like new once more. They made Sakki into their fearsome icon. After failing in a series of missions, Lord Daito committed seppuku (ritual disembowelment) with Sakki, tainting its nature and causing the metal to rot once again. Tekagi outlined a ritual to purify it with innocent blood, specifically Father Peter Nova, a priest working the inner city; Navajo activist, Singer Tsilkali; and Nobel Peace Prize Winner, Dr. Aaron Sokoto of Aradenni. 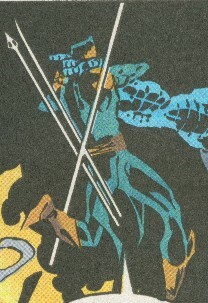 Sakki drank deeply from Father Nova, but ultimately Elektra slew the evil ninjas, using Sakki to kill Tekagi, ending the threat of the Snakeroot and the evil sword at the same time. It appeared that Sakki also served as the Snakeroot's connection to their demon-lord, the Beast, as an image of the Beast was seen reflected on Sakki's surface as Daito spoke of the Beast punishing him for his potential failure. He served in the Hand alongside Elektra years ago. He correctly suspected that she had only joined the Hand to attack them from within to prove herself to Stick and the Chaste, telling her there would be no mercy for her if that turned out to be true. When he watched her as she bathed in a lake, she telepathically commanded a group of agents of the Hand to attack him, but after he slew them all and confronted her once again, she allowed herself to give in to his passion, as she had been lonely for some time after leaving Matt Murdock. As part of the Snakeroot, Tekagi served as second-in-command to Lord Daito, retrieving the body of John Garrett, participating in the creation of Erynys, leading the capture of Eddie Passim, and battling for the possession of the About Face virus. 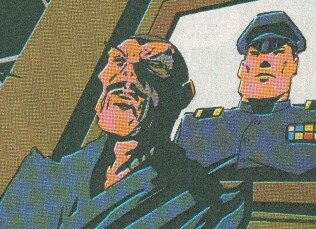 After Daito's suicide, he took over leadership of the Snakeroot, devising the plan by which they could restore Sakki's power via the blood of innocents. It was he who overpowered Elektra and slew the first target, Father Peter Nova, but he made the mistake of focusing entirely on his quest, thinking of Elektra as inconsequential and leaving her alive. Some of the other Snakeroot accused him of still harboring feelings for her. In final battle, he fought Elektra savagely, but fell prey to the tree-frog venom in which she had soaked her army. Weakened by the poison, he was skewered by Sakki itself, further destroying the power of the sword and ending his life simultaneously.